The Democratic Republic of the Congo (DRC) is the second largest country in Africa and borders Angola, Republic of the Congo, Central African Republic, South Sudan, Uganda, Rwanda, Burundi, Tanzania and Zambia. It is home to highly endangered great apes such as bonobos and gorillas. 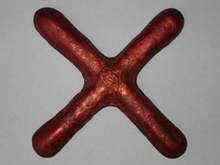 The Katanga cross was an old DRC currency made from copper in the shape of an X. One Katanga could buy 10 kilograms of flour and six chickens.